Eva (not real name) was 33 years old when she was diagnosed with breast cancer. She underwent surgery at a hospital in Hong Kong in June 2009. Right breast mass at 1 o’clock, lumpectomy. Diagnosis: Infiltrative ductal carcinoma, grade 2. No sentinel lymph node metastasis (0/14). Tumour size: 1.1 + 0.6 cm. Positive for estrogen and progesterone receptors, highly proliferative activity. Negative for c-erbB-2 oncoprotein. After surgery, Eva received 6 cycles of chemotherapy – 3 cycles using FEC (5FU + epirubicin + cyclophosphamide) and 3 cycles of Taxol. This was done in Hong Kong. She received 30 radiation treatments in Macau. There was no further medication after this. A follow-up mammogram in 2011 showed everything was clear. In 2012 (i.e. some 3 years later) Eva started to have back pain. 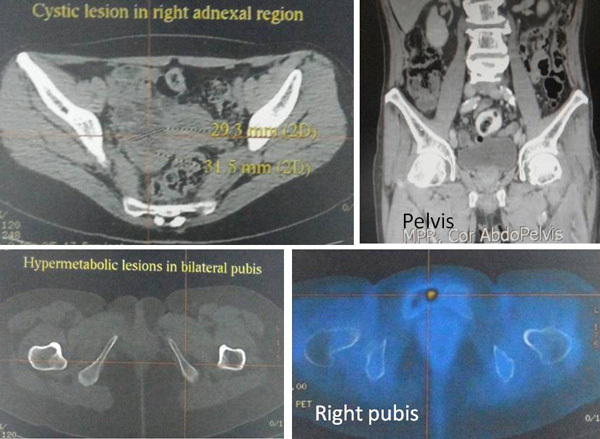 MRI in December 2012 showed some spots in her lumbar. 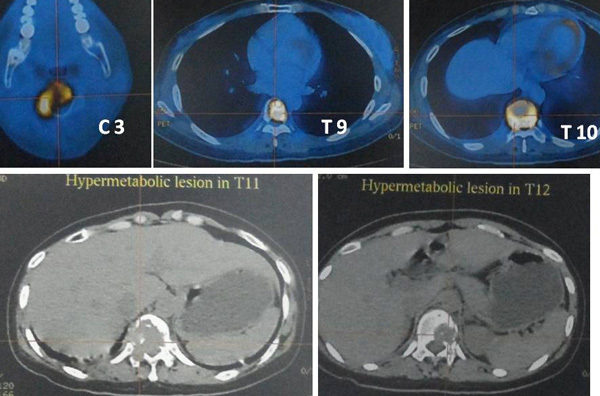 In January 2013, a PET / CT scan showed extensive bony metastasis. She was prescribed Tamoxifen and Xeloda and pain killers. After taking Xeloda she was not able to sit down or walk. She had to be hospitalized for a week and given painkiller injection. She was discharged and had to use the wheelchair. At the end of February 2013, Eva decided to return to her home in Indonesia. In late March 2013, she consulted an oncologist in Penang. She was told to undergo chemotherapy again using Carboplatin. She has to take an oral drug, Navelbine. She has to undergo six cycles of this treatment and each cycle would cost RM 7,000. In addition she needs a monthly injection of bisphosphonate for her bone. This would cost an addition RM 1,700 per month. Can the treatment cure her? 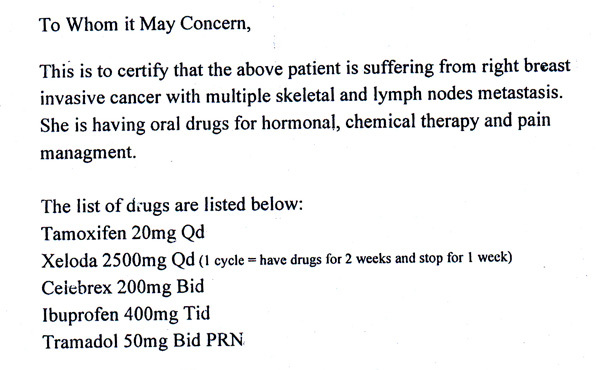 The oncologist said: Not sure! Eva refused further medical treatment. Eva and her mother (who also has cancer) came to seek our help on 21 March 2013. She presented severe pain and was unable to sleep at night. Her movements were very restricted. 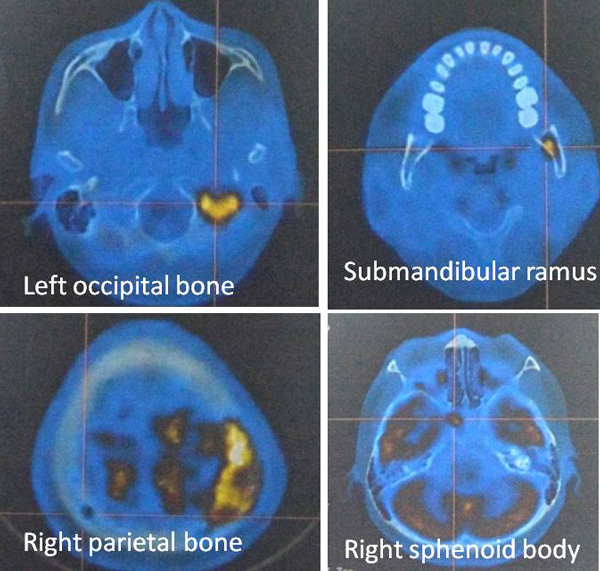 The following are the results of her PET/CT dated 16 January 2013. 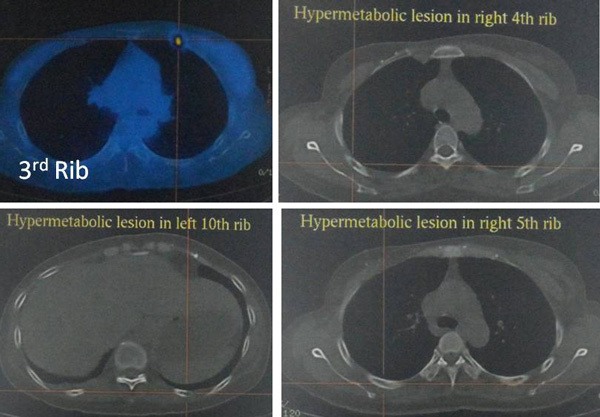 There is no hypermetabolic lesion noted in the residual right breast. There are multiple hypermetabolic lymph nodes seen over the right internal mammary region, right superior mediastinum, right supraclavicular fossa and lever V of right neck. 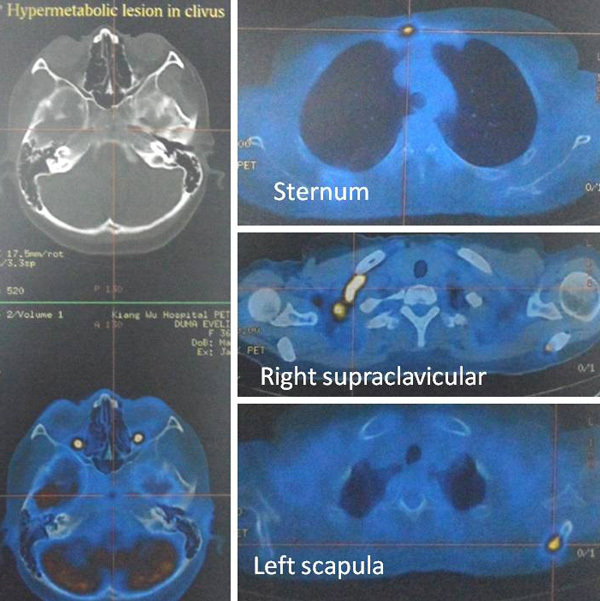 No hypermetabolic node found in bilateral axillary regions, left supraclavicular fossa or left neck. The left breast shows normal FDG uptake. Hypermetabolic nodule noted in the right pectoralis major at the level of 1st anterior rib. 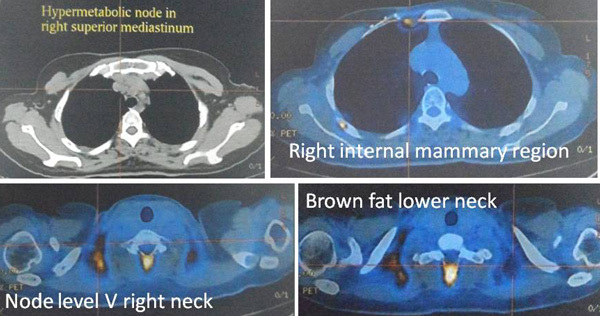 There is physiologic uptake of brown fat in bilateral lower necks. Physiological FDG uptake seen in the brain parenchyma. 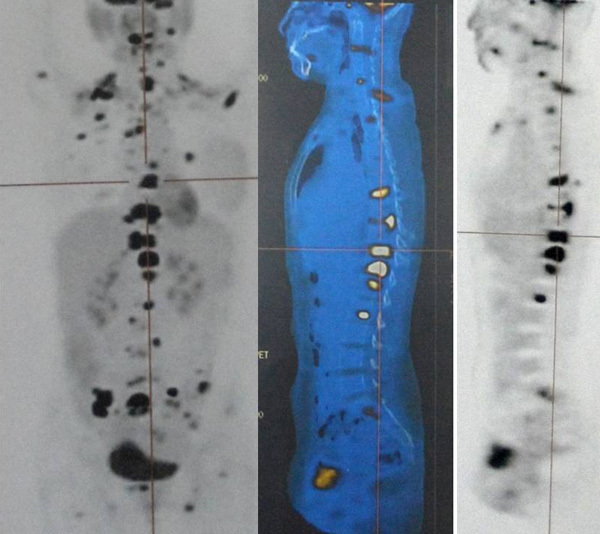 Extensive involvement of spinal column from cervical spines to sacrum. And soft tissue mass in some of the lisions. 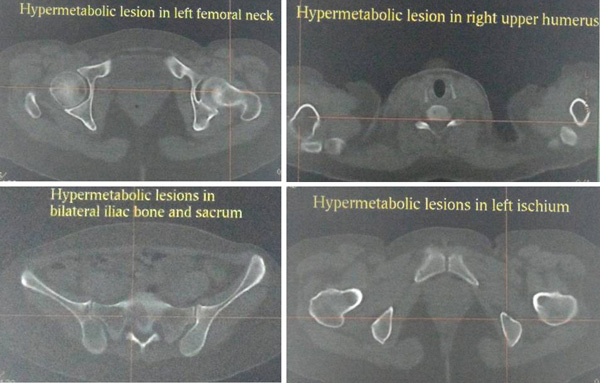 Focal hypermetabolic mass protruding into the spinal canal and compressing the dura sac, including right lateral aspects of C3 level, anterior aspect of T9 and T10 levels, anterior and right lateral aspect of T11 level as well as left anterior aspects of T12 level. We really felt sorry for Eva seeing her in such severe pain. We decided that Eva should try the e-therapy right away and requested her to postpone her return home. She needed to stay in Penang for an additional 5 days. And here is her story. In summary after 2 days on the e-therapy, Eva had less pain and was able to sit up and watch the television for 2 hours. This is something she could not do before. She had to lie down in bed most of the time. With the e-therapy she could sit, walk and move around without much difficulty. We told Eva to come back to Penang for the e-therapy again if her problems recurred. for Bahasa Indonesia: Mengenal Kanker.